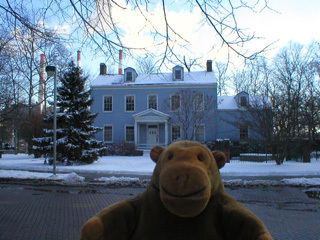 "That looks like a nice house to live in"
Mr Monkey went along the road to look at the Blackwell House. This was built in 1794 and is the fifth oldest wooden house in New York. The Blackwells owned the island from 1686; before that it had been the property of Captain John Manning, who was exiled for surrendering a fort to the Dutch without a fight. 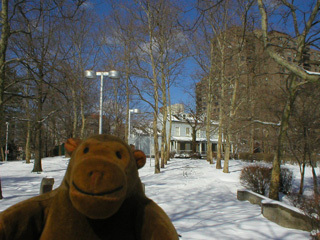 After he'd looked at the Blackwell House, Mr Monkey ran down to the east side of the island, to see the other bank of the East River.